I've really missed having a applique project at hand, so am grateful to have had the time over my holiday break to prep these as I begin the first of four Seasonal Celebration wall hanging quilts. The perfect Slow Stitching as I sip my morning coffee and enjoy yet another sappy Hallmark Christmas movie during this cold, overcast Sunday we are having. Our weekend was spent with our kids, first, celebrating "Poppi's" Birthday. as his help was needed to put out Poppi's "glowing" birthday cake. We also took off on a family adventure together! Did ya notice his adorable Santa hat?? My mom knitted it for him and got it mailed just in time for our trip. He wore it the entire afternoon as he is enamored with everything Santa this year! ...and boarded the Polar Express Train Ride! ...anxious for his very first glimpse of Santa and his elves as we finally arrive at the "North Pole!" It was so special to begin the holiday season as seen through the eyes of a three year old. He sat on his Papa's lap as he received his Christmas Bell and I have to admit, the joy in his eyes as he finally met Santa for the very first time, just filled my Grandma heart. I finished the binding on my Batik quilt during our time on the road. (It's in the wash as I write.) YEAH!!! I close today, hoping this week finds your holiday season off to a wonderful start. I hope it's filled with the love and joy of family, friends and perhaps a favorite four legged buddy as well. I'm realizing my obsession, okay um love, of pinwheels quilts began in 2012 with my very first pinwheel quilt: my Classroom Monster quilt. I made this one for my second grade class. Look closely and you will see the fabric is full of googly eyes, polka dots and little critters! 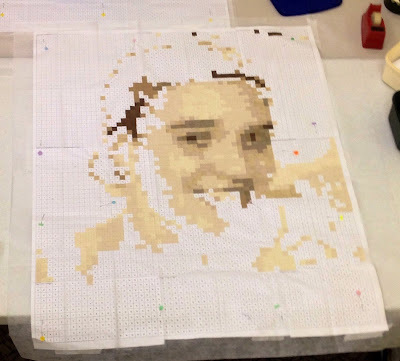 Every year, my students LOVE this quilt! To say the least, I did a lot of stash busting using this pattern! 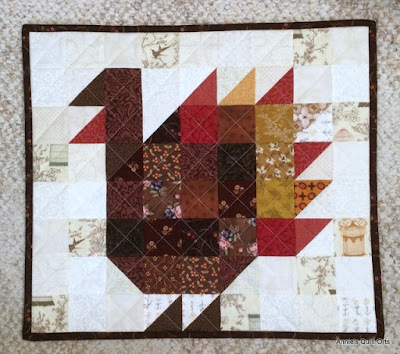 Okay, okay, seriously just how many quilts can someone make from one pattern!?!?!? Welllll....I did share this pattern with fellow blogging friend Jasmine. LOL! For a look at a few more different versions of this pinwheel pattern, click over to Jasmine's who blogs at Quilt Kisses. I mailed her a copy of this pattern and am so inspired at how she used the background color in the pinwheels and added cornerstones! I love her clean, fresh look. 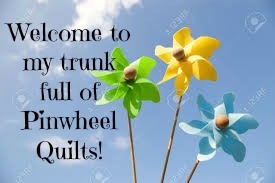 So there you have it, my trunk full of Pinwheel Quilts. Most of which, are being well used as they bring comfort to kids, aunts, daughters and pups alike. Ya gotta love that! Thanks again to Soma for organizing this annual event and to you, for stopping by. Click the picture below to see more Trunks full of inspiring Quilts! PS: Can you believe pinwheels has NOT been a Tuesday Archives theme! It's certainly added to the list now...until then, check out this week's Mug Rugs.